Lockhouse 21, locally known as “Swains Lockhouse” after the family who inhabited it for years, will be the seventh lockhouse rehabilitated as part of the award-winning Canal Quarters program, the C&O Canal Trust and the C&O Canal National Historical Park announced Saturday evening. The announcement occurred at the Trust’s Fifth Annual Park After Dark fundraiser, which raises money to support the Park’s maintenance and preservation, as well as its education program, Canal Classrooms. Trust Board Chairman Michael C. Mitchell and Park Superintendent Kevin Brandt made the announcement. Canal Quarters is a joint partnership between the C&O Canal Trust and the C&O Canal National Historical Park, and has so far provided for the rehabilitation of six historic lockhouses located along the C&O Canal. Swains Lockhouse will be the seventh lockhouse to join the program, and the first rehabilitation undertaken since 2011. Swains Lockhouse will be unique in that it will be the first multi-purpose lockhouse, due to its larger size thanks to a 1890s expansion. Part of the building will house the Canal Quarters program, with accommodations for up to eight guests. The newer part of the building will become a designated space for the Canal Classrooms program. Students on educational trips to the Park will be able to participate in learning activities in this space, only steps away from the canal, Lock 21, and the Potomac River. Plans for an artist-in-residence during the off-season have also been discussed. The lockhouse is in dire need of structural and architectural repairs. The Trust is partnering with the Friends of the Historic Great Falls Tavern and the C&O Canal Association to raise $100,000 for the rehabilitation of Swains Lockhouse. The C&O Canal Trust has committed to raising $75,000 of that amount. Each lockhouse currently in the Canal Quarters program was rehabilitated and furnished to depict a specific time period between 1830-1954. Each lockhouse tells a story of a period of Canal history, and visitors are able to spend up to three nights in the Quarters for a nominal fee. The historical theme for Swains lockhouse has not yet been decided. The Swains Lockhouse will feature electricity and running water when it opens as a Canal Quarters lockhouse. It will join the six already in the program, which have hosted over 10,000 guests from 37 states during over 3,000 stays. Construction will proceed as funds become available. 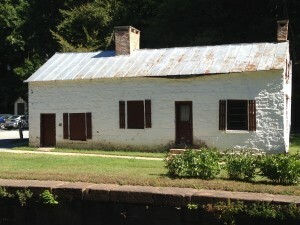 A blog will be hosted on the C&O Canal Trust’s website at www.canaltrust.org later this fall to document the rehabilitation of the lockhouse. The Canal Classrooms program is the Park’s innovative education program that emphasizes a science, technology, engineering, and math (STEM) curriculum through educational visits to the Park. Each lesson is delivered by retired teachers who are trained members of the Canal Classrooms Corps. Over the past three years, the program has served over 25,000 local school children in Great Falls, Williamsport, and Cumberland. Be sure to visit our main Swains Lockhouse page to read all of our blog posts documenting the rehabilitation of this historic structure.